My name is Glenn Nichols, I started this company with my wife Cindy in pursuit of interest of Parrots. We are parrot pet owner and light breeders with selective owners only, and with apr. 25 parrots. Please visit our FaceBook pages at Parrot Love to become more personally oriented. This is a photo I took with my Nikon SRL and slightly edited with adobe CS3 and Genuine Fractals of a birds in our flock. This is Cracker and Cylde, both are male breeders of which their mates have passed away. I can't believe it that they would be living together in the same cage today. Of the two sets we had 5 chicks and two greens GW and Stitch are with us today. , my pride and joy!! It was reproduced by an associate on Digital Canvas, with quality materials to resist UV fading. It measure 16inch x 20inch on the actual canvas, mounted on wood frame and nailed to the frame. The outside of the frame is 26inch x 22inch. I usually would not mention this, but in all considerations we net about 25% of all our products and will offer a contribution to a non profit parrot foundation. 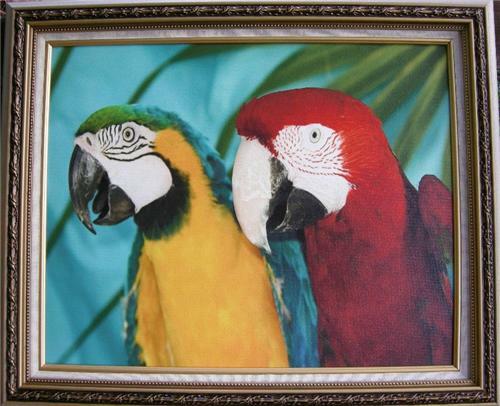 I would love to make a custom framed picture for you and your parrot, please add $20 for this effort and allow 2-3 weeks for the delivery time. Sincerely Glenn Nichols; and God bless the parrot lovers for I know what it takes in energy and time!